She was telling the truth! Lesley Allin that is, the author of the Great American Food cookbook. I've done several good recipes of hers before though the last two was quite so-so that's why I was quite reluctant to try once more. But I had to because all my other cookbooks are packed in boxes (for our move) and hers is the only one available that has a blueberry muffin recipe. 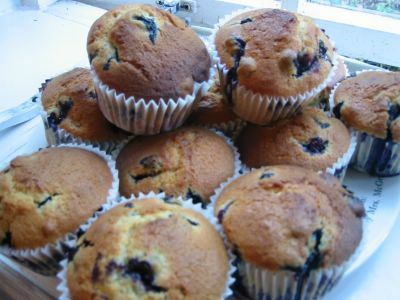 I just have to make some since I can't resist the heaps of blueberries in the supermarkets. They looked all so plump, juicy and delicious. They're good for you, too. Besides being a good source of vitamin C, fibre and being fat-free, it apparently can lower cholesterol as well. Preheat oven to 400°F/200°C/fan 180°C. Grease or line with paper liners a 12-hole muffin pan. Combine the flour, salt, and bicarbonate of soda in a bowl. Mix well and set aside. In a big bowl, beat the butter and the sugar. Add the eggs one at a time. Beat until light and fluffy. Add the sour cream and lemon rind and/or vanilla. Beat to mix. Fold in the flour mixture with a wooden spoon. Spoon the mixture into the prepared muffin pans. Sprinkle the tops of the muffins with about 1/2 tsp of granulated sugar. Cool for 5 minutes before removing muffins from the pan. *Note: You may use either the lemon rind or vanilla or use both. 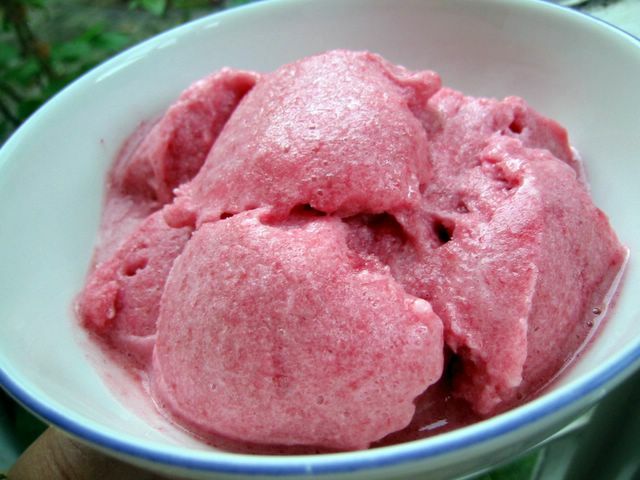 Hey, stay awhile and have some raspberry sorbet. We gotta beat this summer heat with other than sitting in front of an electric fan or lying on the beach. Cold and icy confections are one of my favourite things in summer. One of the more popular one is the sorbet. Very much like an ice cream except there's nary a drop of dairy in it. Because of its ultra low fat properties it's well loved by dieters and the health conscious. Well, I do diets but I wasn't too keen on sorbets before until I made this one last week. The intensity of the fruits' flavour and its instant yumminess further reinforced the idea that homemade is better than shop-bought. Just look at that pink confection speckled by pockets of raspberry pulp. Isn't it pretty? I found this recipe by chance when I was lazily surfing at the Daily Telegraph's Food and Drink Section whereupon I saw Tom Norrington-Davies' article and recipes of sorbets. Thanks Tom! I chose to make this one chiefly because I've got all the ingredients right in my fridge. Besides raspberries are everywhere in the shops so it makes sense to buy and use what's in season to take advantage of its freshness at the peak of its flavours. He was right when he said that the raspberry and banana combination was a revelation. It was indeed with the banana giving it a creamier body and nicely combining with the distinctive taste of the raspberry. This time I followed Tom's recipe to use fresh egg whites. Next will be time to try the booze. See these two are used to slow down the formation of ice crystals as you freeze it. I try to avoid using fresh egg as much as possible so we'll see how it goes next time I make a sorbet. Place the sugar and water in a saucepan. Stir to dissolve the sugar. Bring to boil then cool completely. Puree the banana, raspberries, lemon juice, and syrup in a food processor or blender. Beat the egg white to soft peaks then fold into the fruit mixture. Put the mixture in a bowl (if it is not yet in one) and then put it in the freezer. Remove from freezer and you should see a rim of soft, frozen sorbet around the edge. Whisk it back into the middle using a hand whisk or a fork. Freeze it again this time for 2 hours. Freeze for the third time for 1 hour. Beat it for the last time and transfer it to a tub or container for the final freezing. If you freeze it completely, let it stay in the fridge for about 15 to 20 minutes before serving it. Suggested serving: pair with rich chocolate ice cream. *Note: You can skip all the freezing and beating by using an ice cream machine.